4th Edition M-GMAT Strategy Books, Should I get latest one? I have older copies of the Manhattan GMAT Supplemental Strategy Books for Quantitative and Verbal studies. It is 4th Edition and published around 2009. I took the exam before and decided to call it quits. However, recently been re-energized to re-take the exam today. GMAT friends/takers/experts, I believe M-GMAT has 7th or 7th edition out, in your opinion and experience, would you recommend I purchase the newer books? These are the supplemental verbal and quant books. Will the newer supplemental verbal/quant books have new strategies and tactics compared to the 4th edition? If your answer is yes, get the new books, can you please provide your reasoning and logic, I would greatly appreciate your time and insights. 1) How did you score on the Official GMAT (including the Quant and Verbal Scaled Scores)? 2) How long ago did you study (and for how long?)? 3) What study materials did you use? Thank you for your response and follow questions. 1) How did you score on the Official GMAT (including the Quant and Verbal Scaled Scores)? Quite honestly, I do not remember it was quite some time ago, but my total score was 620 if that helps. One additional change from the last time I took this exam, is my mental state. I am much more confident and even excited to tackle this exam. Previously, I was not excited, and even intimidated. I know I can ace this exam and I know I can get into my target schools. I just want and need to make sure, first, I have the right study tactics and plan to earn the score I want. I will then figure out the rest later, but first step is getting that score. Rich, thanks for listening and for the response. 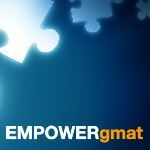 Since you last studied over 5 years ago, it's likely that some of your GMAT skills have 'faded', so it would be a good idea to take a FULL-LENGTH practice CAT Test; you can download 2 for free from www.mba.com (and they come with some additional practice materials). If you want to do a little studying first, so that you can refamiliarize yourself with the basic content and question types, then that's okay - but you shouldn't wait too long to take that initial CAT. That score will give us a good sense of your natural strengths and weaknesses and will help provide a basis for comparison as you continue to study. Even though you are now allowed a choice of 3 different 'orders' of the sections, a FULL CAT still takes about 4 hours to complete, so make sure that you've set aside enough time to take it in one sitting. Once you have those scores, you should report back here and we can come up with a study plan.